In the past year, growth of the global services market, which comprises global revenues of US$198 billion, remained modest overall—5 to 7 percent in 2017 as compared to 6 to 8 percent in 2016. 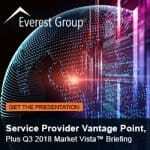 However, some key pockets are growing faster than the overall market: nearshore and onshore, in-house models, digital services, and engineering services being key examples, according to Everest Group, which published this week its annual report on the global services locations. Global services delivery is increasingly being characterized by nearshoring. While Asia Pacific has been the global services location leader in terms of revenue, nearshore geographies, particularly Nearshore Europe, are growing rapidly due to availability of complex skills, increased regulatory oversight and multi-lingual skills. The share of Nearshore Europe in terms of revenue reached 14 to 19 percent in 2017, up from 8 to 13 percent in 2014. Ireland, Poland and Scotland are the top delivery locations, followed by Ukraine, the Czech Republic and Portugal. Also, reshoring continues to grow amidst the increasing needs for data protection and portfolio optimization. In fact, 52 percent of the setups of the top 20 global service providers were onshore in 2016-2017, as compared to 32 percent in 2012-2013. 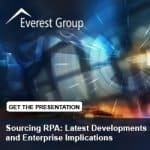 “Two more global services trends worthy of note are the shifts we’re seeing in functions and sourcing models,” said Anurag Srivastava, vice president and director of the Global Sourcing practice at Everest Group. “At a functional level, engineering and R&D services and especially IT services dominated the global services industry across all geographies, with Nearshore Europe showing significant growth in this regard. Specifically, the percentage of new center setups in Nearshore Europe for engineering /R&D services jumped from 18 to 25 percent from 2014 to 2017, while the percentage of setups for IT services jumped from 41 percent to 56 percent. Since 2014, the total number of new center setups for digital services (including setups by GICs and service providers) has jumped 105 percent, from 91 in the 2014-2015 period to 187 between 2016 and 2017. While revenue growth from traditional IT-BP services remains low, emerging technologies such as cloud and automation should witness significant growth as enterprises look to improve cost savings and productivity. Profit margins may reduce marginally in the short term, as providers and enterprises increase focus on data protection processes and infrastructure. The number of full-time employees engaged in delivery of transactional work will grow at a lower rate. All players in the global services market will increasingly focus on reskilling and upskilling talent across multiple emerging technologies. Investments in automation technologies will grow, which will have a sustained depressive impact on headcount growth. APAC will continue to be the largest geography for the global services industry in terms of new center setups due to cost arbitrage and ample talent availability; however, other geographies, such as Nearshore Europe, are expected to grow faster. Additional research findings and predictions are discussed in “Global Locations Annual Report 2018: Service Delivery Portfolios in a Disrupted World,” a comprehensive guide to understanding the nuances of the global services locations landscape and interpreting locations-related developments. This research offers insights into the size and growth of the global services market, updates of locations activity, changes in risk profiles of locations, and an analysis of the relative maturity, arbitrage and potential of locations for multiple functions.